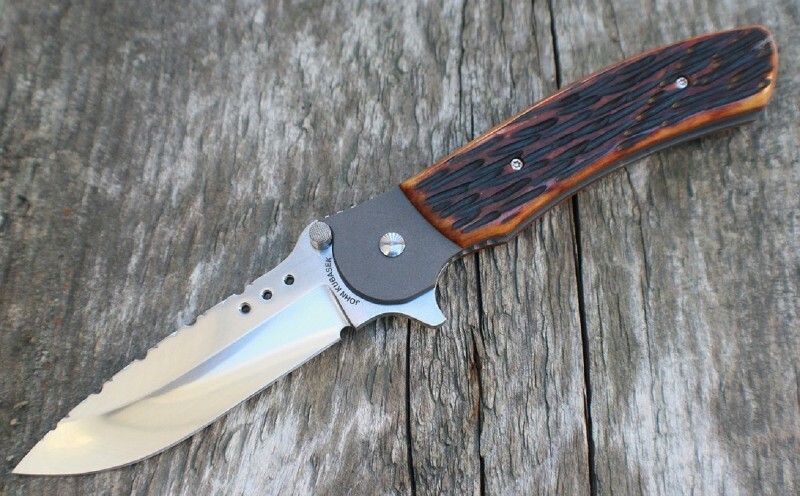 This John Kubasek custom drop point flipper is his typical design and style folder. Technically! a frame lock since the back side handle scale does not fully cover up the lock but for all intensive purposes, it's a liner lock. This design does, however, provide you with a built in over-extender safety and the thick handle definitely fills the hand like it should. The 3.5" drop point blade is made from hand rubbed satin finish CPM-154 and has file work on the blade spine. The jimping on the thumb ramp and ambidextrous thumb studs are absolutely perfectly executed and provides superb purchase, though we highly recommend you use the flipper at it creates superbly quick action. The handle is amber jigged bone with bead blasted titanium liners. The titanium pocket clip is a deep carry tip-up. John utilized bronze washers in the pivot for some super snappy action!